Fitzwater Street Philly Bagels and Passyunk Avenue Philly Bagels are owned and operated by fifth generation bagel maker, Aaron Wagner. In an effort to provide more Philadelphians with the delicious, quality bagels that he and his family provide at South Street Philly Bagels and Chestnut Street Philly Bagels, Aaron proudly decided that he would expand. South St Philly Bagels, Inc. opened its doors in the snow storm of 1996. Working in the bagel business since 1971, Michael Wagner decided to bring the family recipe to Philadelphia. Mike learned how to produce the dough, hand forming each bagel, and baking each bagel from his Brooklyn raised father-in-law, a member of the now dissolved Bagel Bakers Union. The tradition of bagel baking has been going strong for five generations now, continuing a time honored tradition. 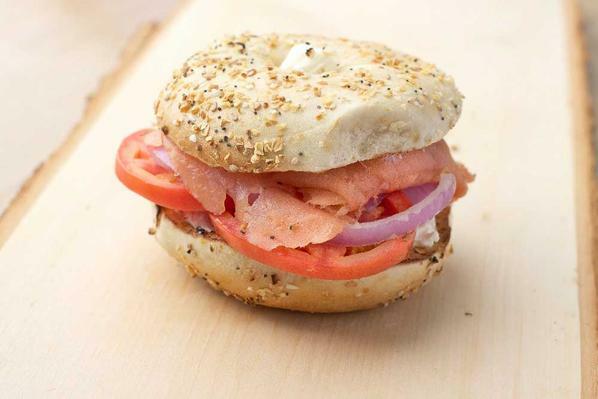 LOX, CREAM CHEESE, CAPERS, TOMATOES, AND RED ONION. ASK ABOUT OUR DAILY VEGAN OPTIONS! $4.00 10 oz. / $5.00 12 oz. / $6.00 16 oz. $2.00 12 oz. / $2.25 16 oz. Let us cater your next event. No event too big or too small. Hit us up! ASSORTED SLICED BAGELS, YOUR CHOICE OF CREAM CHEESE, BUTTER AND JELLY. BAGELS PREPARED IN A BASKET. CREAM CHEESE LAYED OUT ON A TRAY WITH A BED OF LETTUCE. ASSORTED SLICED BAGELS. DELI MEATS AND CHEESES. BAGELS SERVED IN A BASKET. MEATS AND CHEESES LAYED OUT ON A TRAY ON A BED OF LETTUCE WITH TOMATOES, ONIONS, CUCUMBERS, AND PICKLES. ALSO INCLUDES MAYO AND MUSTARD. ASSORTED SLICED BAGELS, NOVA LOX, YOUR CHOICE OF CREAM CHEESE AND ASSORTED VEGETABLES. BAGELS SERVED IN A BASKET. NOVA LOX AND CREAM CHEESE SERVED ON SEPARATE TRAYS OVER A BED OF LETTUCE, WITH TOMATOES, ONIONS, AND CUCUMBERS. ASSORTED SLICED BAGELS, YOUR CHOICE OF CREAM CHEESE, AND WHITE FISH SALAD, BAKED SALMON SALAD, AND ASSORTED VEGETABLES. BAGELS SERVED IN A BASKET. NOVA LOX, CREAM CHEESE, WHITE FISH AND BAKED SALMON SALAD ON SEPARATE TRAYS SERVED OVER A BED OF LETTUCE WITH TOMATOES, ONIONS, AND CUCUMBERS. ASSORTED SLICED BAGELS, THREE SALADS, ASSORTED MEATS AND CHEESES, COOKIES OR BROWNIES, AND A FRESH FRUIT BOWL. BAGELS SERVED IN A BASKET. SALADS, DELI MEATS, AND CHEESES SPREAD OUT ON A TRAY ON A BED OF LETTUCE WITH TOMATOES, ONIONS, CUCUMBERS, AND PICKLES. ALSO INCLUDES MAYO AND MUSTARD.